Nitric oxide (NO), as a diatomic free radical gas, appears to be involved in development, growth, and biotic/abiotic responses in plants. Also, hydrogen peroxide (H2O2), a reactive oxygen species, has been considered as an important signaling molecule that regulates various physiological and biochemical processes in plants. A large of evidences implied that NO and H2O2 signaling could affect each other at different levels of regulation under common conditions. Meanwhile, NO might have similar kinetics with H2O2. The interaction between NO and H2O2 is complex which has essential role in mediating signaling transduction pathway in plants. 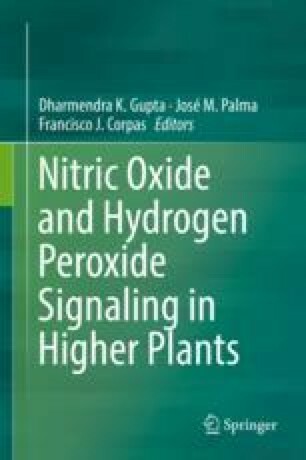 This chapter aims to introduce these evidences in our understanding of the roles of NO and H2O2 signaling network in plants and their interaction. This research was supported by the National Natural Science Foundation of China (Grant Nos. 31860568, 31560563, and 31160398), the Research Fund of Higher Education of Gansu, China (Grant No. 2018C-14), the Post-Doctoral Foundation of China (Grant Nos. 20100470887 and 2012T50828), the Natural Science Foundation of Gansu Province, China (Grant Nos. 1606RJZA073, 1606RJZA077, and 1606RJYA252), Scientific Research Foundation for the Yong Graduate Supervisor of Gansu Agricultural University in Lanzhou, China (GAU-QNDS-201709), and Feitian and Fuxi Excellent Talents in Gansu Agricultural University.